Discussions on specific A/C building techniques. I have a number of older kits to build with raised panel lines. I sometimes find reviews or build blogs on the web stating that it is a MUST DO operation to rescribe all these lines but I do wonder if that is really necessarty. So, what do you all think about this? Do you remove raised panel lines? If yes, how do you go about doing that? If not, do you have any special tricks to make the most of those raised panel lines? i guess it is really up to the individual but i have never re-scribed panel lines. i do a pre shade or apply a silver base coat under the color coat and lightly sand the raised lines until the silver shows through. i suppose you could use a black or brown base coat in place of the silver too. My first kit I built after getting back in was an old AMT Hawker Tempest. It dates back to '79 and it had raised lines all over it. I looked at that $5 kit as an experiment. Part of that experiment was to sand down and rescribe all the panel lines, which I did, and which I am glad I did. They were heavy handed, maybe not strait in all places, but they really added to the detail when I was done. I just recently finished an old Tamiya A6M2-N floatplane which goes back to '73. I approached it as a quick fun build. It had recessed lines on the wings, but raised lines on the sides of the fuselage and the floats. I decided to scribe the fuselage because a) it was easy to sand, b) they were just long strait lines and I didn't think it would take long. I didn't take my time when I did them and as a result they are not as good as I'd like. But I also didn't want to fill and rescribe them. So I just let it go. I let the raised lines on the floats go too, as they would not be very noticeable down there. And I don't notice them at all. They picked up the washes and add detail. They are fine. I think raised lines on the fuselage would have really bothered me. So, you don't HAVE to do anything. Do whatever you want. It's your money and time. If you decide to do it...take your time. Don't rush it. Make the result worth the effort. If you don't want to spend the time, move on. Enjoy the hobby. Raised Panel lines? I'm all for them! I do realize that Messerschmitt 109s weren't riveted together by 19th Century iron boilermakers, but I still had fun with Airfix's 1975 rendition. Honestly, raised panel lines, rivets, and such aren't the end of the world. Unless they really bother you, it is ok to leave things alone and just have fun building the model! Funny we should be discussing this topic. I was strolling through my LHS shop recently and came across Monogram's 1990 release of a 1/48 F-106, one of my favorite aircraft. It has very fine raised panel lines and rivets-- so fine they are almost beautiful in appearance. And much better looking in my opinion than the sunken rivets and panel lines on Trumpeter's newer kit. I bought the kit immediately (couldn't go wrong for just $10). My thought is with a coat of primer and then some ADC gloss gray, the panel lines and rivets will be at about the same level as the top surface of the paint, which can then be sanded lightly, allowing those lines and rivets to just barely peek through the paint-- just like the real thing. With engraved panel lines and rivets, they would be sunken into the surface of the paint. Most real aircraft panels abutt each other without interruption by a sunken panel line. I admit, it's easier to get an immediate result with engraved lines, but I'm starting to think raised lines and rivets may not be all bad either with some TLC. 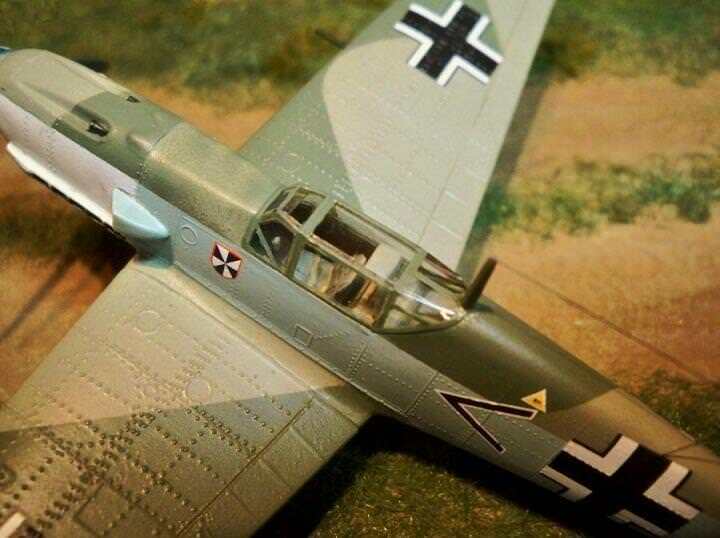 Another thing-- Tims photo of Airfix's ME109 is an illustration of raised rivets "gone wild", but on many WWII aircraft, raised rivets were found all over the airframes, but are noticeably missing in many model kits. That's a bit aggravating for me sometimes. I have Trumpeter's excellent TBF in 1/32 scale-- the rivet patterns are nicely done, but they should definitely be raised, since they would be very noticble in 1/32 scale. Ideally, a combination of raised and engraved detail would look the best, but in the modeling world, we seem to get "either or". I never rescribe the Monograms: across the joints, a knife slice can raise a matching raised lip. I find the flair of Monogram's detail (varying in intensity and manner, like the real thing) superior to most engraving, especially on larger surfaces. Less so on single engine types. But it does often look bad with light faded paint: Darker finishes or metal looks better. I've never felt the need to remove raised panels lines it's just a whole lot of grief I don't particularly need or want (scribing is not my strong suit). I'll replace lost lines with some very fine stretched sprue but that's about it. And I agree with the earlier comments you look at the real thing and there are no recessed lines or indented rivets, flush and slightly proud sure thing but not recessed. I understand why recessed panel lines are "in" they take pin washes well and stand out beautifully and are easy to replace when sanding removes detail. But I like working with what a kit gives me whether it be raised or recessed I generally try to keep to what's provided where appropriate. I also agree that it's entirely up to the individual you do whatever you want to do! It's your kit and hobby after all.